I continue to maintain that few things in life are actually free, and this is no exception. 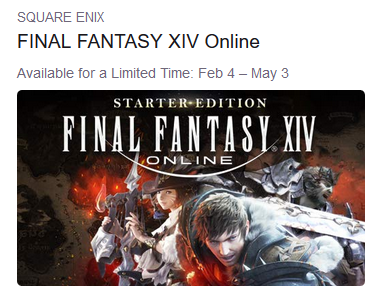 IF you are an Amazon Prime member and you have a Twitch account and you have linked your Twitch account to your Amazon account then, right now through May 4, you can get a free copy of the Final Fantasy XIV Starter Edition through Twitch. It took me a bit to figure out where to claim this. I saw it mentioned on Twitter and we know that Amazon and Twitch have a couple of methods for handing out free stuff. As I have mentioned in the past, there is the Twitch Prime page where you can claim games to download via the Twitch client. It is available there, but due to the way the page is sorted, it is down at the bottom of the list as opposed to up with the free games. You can also find it via the main Twitch site in a browser. It is in the Prime Loot menu, the little up at the top of the page. You cannot find it in the Twitch Client. At least I could not find it in the Twitch Client. It seems like the integration with the client is less than complete. Claiming your copy seems simple enough. You click a button to get a code for the game, the follow the link provided to the download page. Having never played FFXIV, and feeling that was perhaps a bit of an omission on my part, I decided to grab a copy. I wasn’t burning to play it RIGHT NOW, but could foresee a time in the spring or summer, before WoW Classic looms into view, where I might have the time and inclination to give it a try. So I downloaded the installer to at least get it setup. And then I hit “accept” and the dialog goes away for a flash, only to return and ask me again… and again… and again… and off into the distance so far as my patience will sustain me. I did the usual thing, ran it as Administrator, but that didn’t help. The install page, which seemed a little behind the times, suggested that I run it in Windows Vista SP2 compatibility mode… let me remind you that Windows Vista came out in 2006, or a good seven years before FFXIV… but I gave that a shot. I tried the various Windows 7 modes. I turned off the virus protection. I Googled around for some other options, but found mostly variations on the what I had been trying, none of them successful. I did run across one thread that said if you were running on Windows 10, as I am, that you needed to install DirectX 9 manually first. That seemed an unlikely solution, since DX9 was from the Windows XP era and we were now getting into things more than a decade before the game launched. Thinking that there must be an updated installer somewhere, I went poking around for that as well. I had no luck on the Square Enix site, where downloads were behind a $19.99 barrier. Likewise, I figured there must be an installer that worked over on Steam. But that too had a $19.99 tariff in the way. So I set it aside. Like I said, I wasn’t in a hurry to play it right away. I copied the code off for later use. I’ll poke around a bit more later. But the option is there. You can get a free copy, if you have met all the criteria and can get the installer to run. This entry was posted in entertainment, Misc MMOs and tagged Amazon Prime, Final Fantasy XIV, Installer Problems, Square Enix, Twitch on February 10, 2019 by Wilhelm Arcturus.